DO NOT order your waist size or pants size! 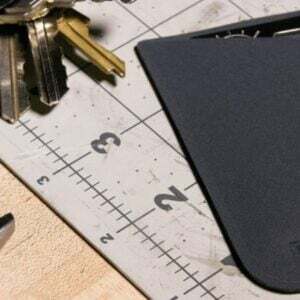 Lay an existing belt out flat and from where the leather folds at the point where the buckle is attached, measure to the hole that you typically use. Please remember when ordering to take into account any holster or accessory that may be worn. For in-between measurements use the next size up as our belts will not stretch over time. We size our belts from the fold in the leather to the #5 hole (count the hole from the tip, ~7 inches) as per the diagram below. While the inner polymer layer of our belt is largely maintenance free, the outer layer will need to be cared for like any other quality leather item.